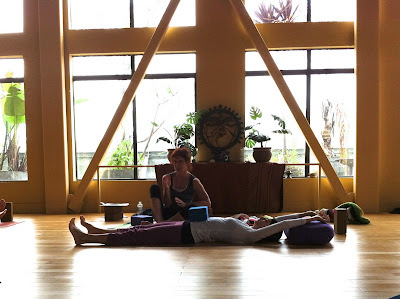 It was a rainy day in San Francisco--perfect weather for being inside a spacious yoga studio with a wall of windows. I was surrounded by a group of teachers dedicated to helping themselves and others heal. Some of them were cancer survivors in remission. Others were in the thick of treatments. And yet others (like me) either work with those affected by cancer or were somehow inspired to do so. As people began introducing themselves around the semi-circle, I could feel their words like music that speaks directly to your heart--the kind of music that takes you out of your head and delivers you to life. I knew that I'd probably cry when I did my introduction. (I've always excelled at crying in front of others. My emotions diffuse through my skin, and I'm so sensitive to people's energy, which makes it hard to keep from crying. I was always embarrassed of this as a kid, but I've learned to run with it and embrace it as a strength.) I could feel my mom in the yoga studio with me and the stories of those around me were so moving. There was some serious strength present and I felt honored to be be a part of it. This manifested as tears. Tari Prinster, a yogi and a cancer survivor, shared with us some of her wisdom. I learned the science of why certain postures strengthen the immune system and why some should be avoided. She addressed the emotional, mental and physical needs of someone with cancer and how to work with these needs. I started going back through my notes tonight and wish I had done this a day after the workshop, rather than a week. I can barely read my own writing! Tari was wonderful and I hope that I can do a future training with her. Normally her teacher trainings are 45 hours. This was just a 2 day workshop (and I could only attend one day). I look forward to sharing what I learned with others. I'm going to start with my husband's aunt who is interested in incorporating yoga into her treatment. From there I hope to offer a class to other people in the community. Colleen– I just returned to NYC after 6 days in Napa with my family. I tried to stay 'off the net' during that time. Surfacing now to your blog post. This is beautiful. I will share it with others in an email to the group and on my blog. Thank you! As you go forward in your with with your Aunt or others, it at anytime you have questions, please email me. Answers will be shared with all on my blog. My dream is to have AskTari be regular feature in Yoga Journal. Please join a 45 training. See the schedule at www.tariprinster.com. Sounds amazing. I love that you excel at crying. Remember Finn's first birthday? So beautiful. Your going to be great at this. CoCo-your blog is the only one I ever read and I love every word you type. I can hear you in the words and think of our days at the YO as roomies. I think you are so strong and courageous. I wish I could learn Yoga from you...hugs and kisses from MI. HoHo! Welcome to the good life, where the days are long and the chaos is often enlightening. I'm a a yoga instructor, a high school science teacher turned stay-at-home mom (for now), a food lover and a curious, relentless student of everything. Thanking my bike. And the guy who married me. Why butter is better. Paula Dean is right. National Blog Posting Month Day 7: Here I am. Questions for my Mother Part 3: Where do they go?